CONDITION REPORT: Excellent overall condition. The dial is mint and the luminous material is intact with only a slight aging to a cream color patina. The hands are original and the tritium is intact. The bezel is original and in excellent condition without any visibile damage. The rare Apollo XI case back is in perfect condition with all engravings remaining sharp and untouched. The 1116 bracelet remains in excellent condition. NOTES: According to the Omega Museum the present watch was manufactured July 2, 1971 and delivered to Japan. There are three different casebacks associated with the reference 145.022-69. 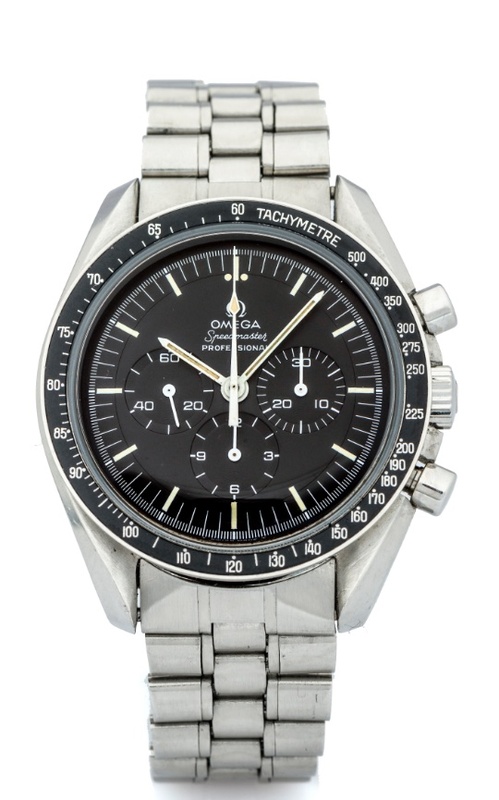 The first being the pre-moon style ‘Seahorse’ caseback, the ‘Straight Writing’ case back mentioning ‘Flight-Qualified by NASA For All Manned Space Missions’ around the straight writing ‘The First Watch Worn on the Moon’ and the last and rarest version has the same straight writing in the middle and OMEGA SPEEDMASTER – APOLLO XI 1969 in an arc around it. These were predominantly delivered in 1971 to Japan.